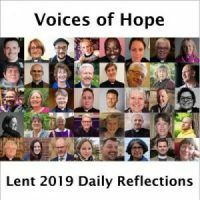 by the Revd Canon Giles Goddard, Former Chair of the Human Sexuality Group on General Synod and member of the Co-ordinating Group for the “Living in Love and Faith” Project. We have just celebrated Advent Sunday. The new year begins. Our thoughts turn to the people of Advent: Elizabeth, the prophets, John the Baptist., and of course Mary. Last weekend my parish held a retreat, when twenty of us crossed London to spend the day reflecting and preparing for Advent. The retreat leader was Revd. Jenny Morgans, the curate from the parish next door: the title of the day was ‘God-bearers.’ We focused on the stories of Mary and Elizabeth – both unexpectedly pregnant, both presumably shocked and surprised, both waiting for these unexpected births. The overarching theme of the day was the notion of Mary as God-bearer, theotokos, enabling us all, through the birth of Jesus Christ, to become God-bearers ourselves. Witnesses to and agents for the love of God, here on earth. All of us. All, all, all! as Desmond Tutu would say. Remembering that Mary would have been an outsider, one rejected by her society, one misunderstood and marginal. But the theme underlying these reflections was the remembrance of the waiting, of the story of the visitation of Mary to Elizabeth as told in Luke’s Gospel. We thought about the process of waiting. Is it passive or active? Are we engaged in what is happening, even as we wait, or are we simply flotsam drifting down the river of time? I had a strong sense of waiting being an active process. As Mary and Elizabeth spent time together, those children growing in their wombs, they must have changed. Their relationships would have deepened. They formed new connections. Mary’s relationship with Joseph would have changed. She had to make sense of these new and unexpected experiences. She had to reckon with the consequences of the ‘yes’ she said to Gabriel. The resonances of the day were, for me, very great. As we wait for the church to become fully reflective of the Kingdom of God, fully inclusive, fully able to grant each person their full potential as God-bearers, are we waiting passively or actively? Is this a time of creation or a time of dryness? Are we coming open-handed into the long and complex process which the church is engaged in, or are we closed and unwilling to change? I had a strong sense that waiting is becoming. There is pain and there is hurt in each of us. Loss and rejection. Heartache and sadness. But there is also Mary’s proud ‘yes’; her bringing of her whole self to Joseph and to the world around here. Here I am! This is me! Let me be me, she might have said to Joseph, and together let’s work out the consequences. The idea of waiting being an active thing, a time during which we can ourselves be transformed, was new to me and I am glad of it. This entry was posted in Giles Goddard, Human Sexuality, Social Justice. Bookmark the permalink.